Since their national debut on the Hannity Show, I have been swamped with patriots wanting to know my opinion of the Black Tea Party. Some are offended by blacks separating themselves. From my understanding, these black patriots are not separating themselves. They are simply hosting tea parties in urban areas. I say, "Right on!" There is a saying, "The enemy of my enemy is my friend." In principle, I would prefer not to have a "black" tea party, republican club and etc. However, there is a catastrophically destructive viscous fire breathing dragon reeking havoc across America named Obama-zilla. 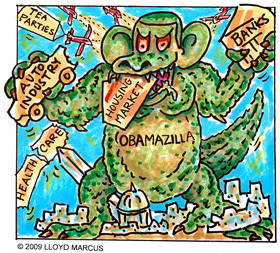 Daily, Obama-zilla is devouring our freedom, liberty and culture; destroying America as we know it. Desperate times require desperate measures. So, while the concept of blacks feeling the need to have separate conservative groups is not my cup of tea, I gladly welcome the fresh troops to join our team, expanding our ranks, to help defeat the vile beast. Also, the liberal media would LOVE for us to reject and beat up on the black tea party. They will exploit any and every opportunity to call us racists and distract us from staying focused on defeating the real enemy of the Constitution, Liberty, Freedom and America....Obama-zilla. So, Black Tea Party, brothers and sisters, WELCOME HOME!